I don’t want it to end. I am speaking, of course, of the San Francisco Giants, and their near-miraculous performance in the postseason this year. After coming back from a two-game deficit last week, winning the division series and advancing to the pennant race, my heart was as full as it’s been in years. Okay, since 2010, when the Giants won the World Series. But still. My devotion to baseball is such that I tend to get very, very excited when things go well (and, conversely, very, very sad when things do not go well). Plus, I am having a great time coming up with new and inventive ways to incorporate black and orange foods into our meals. Sometimes the black and orange components are front and center, but other times, like with these scones, the black and orange bits are a bit more subtle, though no less enjoyable. 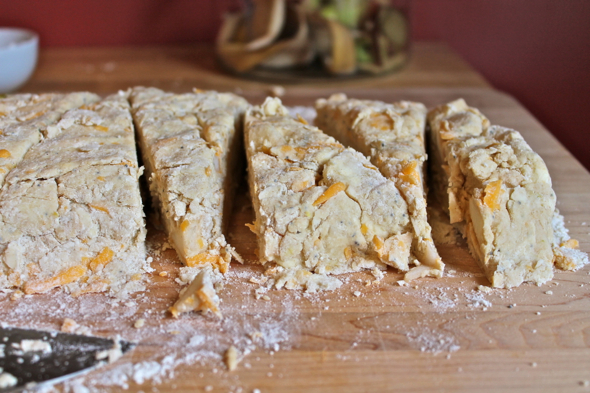 Actually, it just occurred to me that there might have been a more obvious scone to make when adding to my arsenal of orange and black foods: orange chocolate scones. Why did I not think of that earlier? Truth be told, I am glad I did not go the orange and chocolate route. 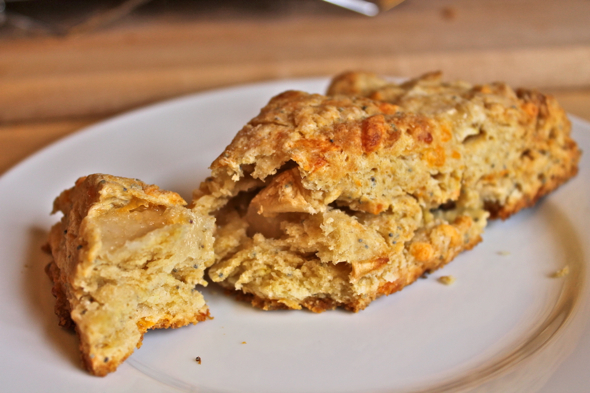 These cheddar apple scones, rich and buttery, but barely sweetened, were an absolute delight. With just a hint of whole wheat pastry flour to add to their heartiness, their pure, simple flavor made for a perfect fall bite. I had a bit of an internal battle with myself before I decided to hold off on adding any pinches of fall-ish spices (cinnamon, nutmeg, etc. ), and, in the end, I am so glad I decided to reign things in. 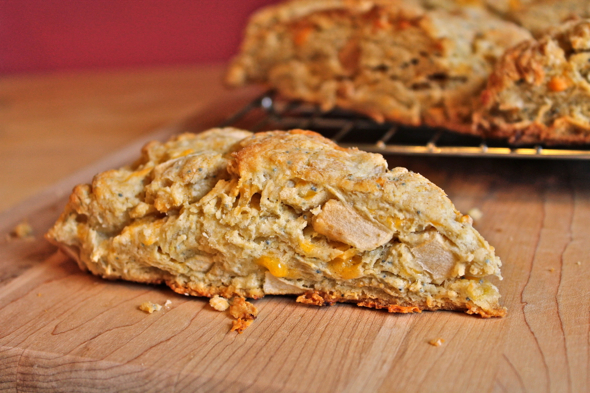 With just enough sharp cheddar folded into the dough to offset the fresh sweetness of the apples, these scones are just lovely. They served us well as both a fantastic afternoon treat and a welcome, celebratory post-game snack. The Giants won, so I am, of course, going to credit the scones. Not that I really need an excuse, but I just might have to make these again for Game 3. You know, because of the good luck they brought the team. Of course. In a large bowl, combine flours, baking powder, baking soda, sugar, salt, poppy seeds, and lemon zest. 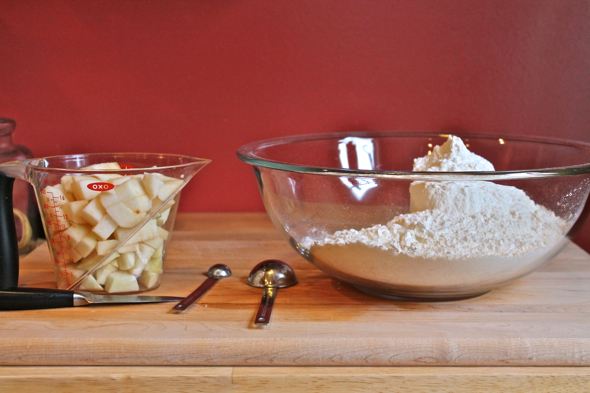 Whisk to combine thoroughly. Using a pastry cutter or two knives, cut the butter into the flour mixture until the mixture resembles coarse crumbs with a few large pea-sized butter bits strewn throughout. Using a wooden spoon or sturdy spatula, carefully stir in the buttermilk until the dough appears quite shaggy and just begins to hold together. 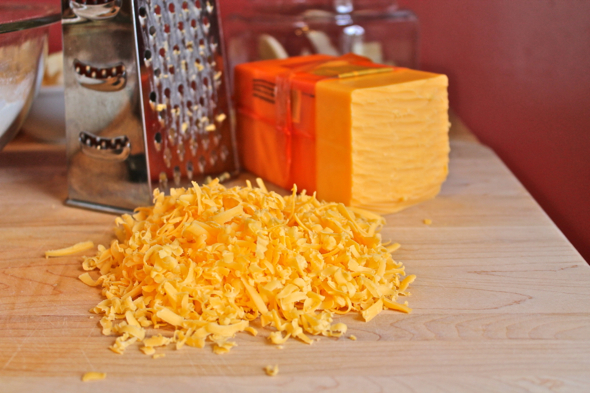 Fold in both the grated cheese and the apple chunks. These looks wonderfully fall-ish and delicious. 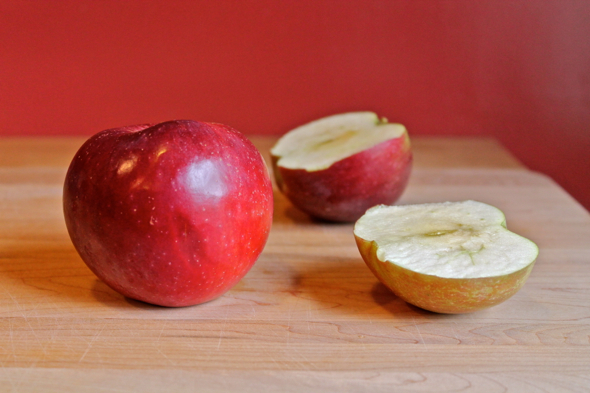 Need to check my apple supply and do some baking. Oh, and GO GIANTS! 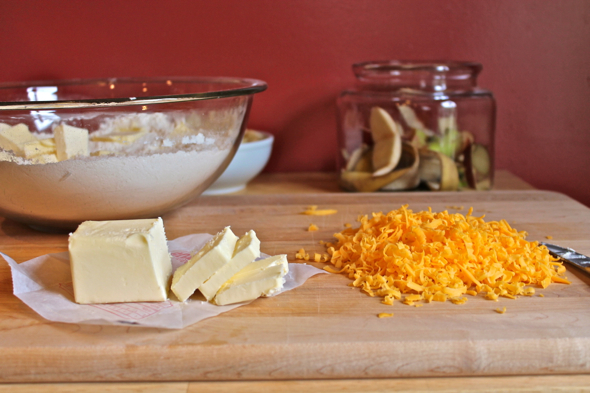 One of my favorite meals is cheese with apples or pears, plus bread or crackers. You just can’t beat that combo. I love cheese with apples, so this sounds awesome. What an amazing combination of flavors. I can’t wait to try these! Cheddar, apple and poppyseeds? In a scone? Genius! Thanks for sharing your recipes!